The murder of 27 years old journalist with his 27 years old fiancée hit the Slovak society badly, and after 25 years of independent state Slovak society woke up from the matrix and the illusion of liberal democratic system was vanished. In the last period Slovak Republic, Poland, Hungary and, partly, Czech Republic became known as countries that are turning their back from the western democratic and liberal principles. But in these days Slovak youth is showing another picture that is completely different from the past and from the official data from surveys. As data from 2017 has shown, 60% of Slovaks thinks that their country is heading into the wrong direction, 53% are calling for change and for that 40% Slovaks are calling for system change. This negative view of their country was visible also among younger Slovaks, 68% of them think that they don’t have any future in Slovakia. But after February 26 everything change, the perception of society towards political and public institutions, the perceptions of society towards their system, and also the perceptions towards political elites who are governing. Citizens anger, distrust and disillusions towards the political elite was transformed into a positive march for a new commitment to western democratic and liberal values. The demonstrations for “Decent Slovakia” immediately led to mass protests across the globe (Slovaks protests were held in Aberdeen, Aalborg, Berlin, Bern, Brno, Brussel, Dubai, Edinburgh, Glasgow, Hague, Hong Kong, Krakow, London, Luxemburg, Madrid, Munich, Ostrava, Paris, Peking, Prague, Stockholm, Vancouver, Warsaw, Vienna, Zurich and Geneva). They stood up against corruption and arrogance of government. Even though the previous prime minister and previous ministry of interior were holding their office more than 2 weeks, and prime minister 3 weeks, the pressures that were coming from the mass protests were above their political powers and position and they resigned. 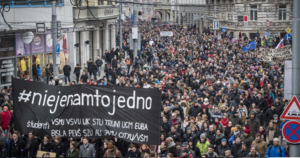 The mass protests went event bigger after previous prime minister Robert Fico personally attacked the young leader of protests and questioned the source of protests. As he said “You can blame me for conspiracy theories, I do not care. I see in them the manuscript that is relatively common and strong in Central Eastern Europe … and you know about what I´m speaking”. Fico also noticed that organisation and management of the protests were highly professional and organized from abroad. Despite this unfair political critique young Slovaks were able to lead the mass protests in a positive and nonviolence mood. 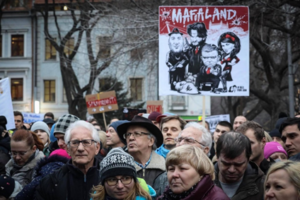 Mass protests calling for a fight against corruption, for protection of liberal democracy and democratic renewal have not always been successful for the protesters. Ukraine could be a perfect example. It also seems that after 3 months of the murder of Jan Kuciak and his fiancée the situation has calmed down. Governmental political elites excited the societal pressure and there are again back in their comfortable position. Nevertheless, citizens and commentators are feeling that something changed in the Slovak society, and it won´t be the same as before the February 26. All the mass protests that were organized after this case of violence were peaceful with messages calling for a new election and a new form of politics, a fight against corruption and mafia state. 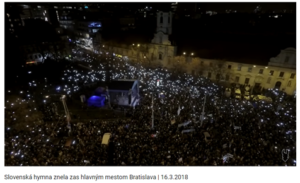 The leaders of protests were able to promote their requests towards two most powerful democratically elected political leaders, to president Andrej Kiska and to Chairman of the parliament Andrej Danko. Even though these meetings have zero political impact towards the changes, there were symbolical and confirmed the strong brand of “Decent Slovakia”. It was not the first time that politics from Central Eastern Europe heard the new generation speak to them. But they need to understand that these changes became structural and that this generation is completely different than the previous one. Young Slovaks are just another example of how the new political generation is growing up to act and speak up rather just listen. This generation grew up Digital, and they are direct, clear and unflappable in their messaging. They are the generation that is refusing to be silent and is calling to complete the revolution of their parents.